Sky’s Prime may have missed out on the next Star Trek series going where none has one before — exclusively to Netflix — but fans of the enduring franchise can celebrate its 50th anniversary on The Zone. 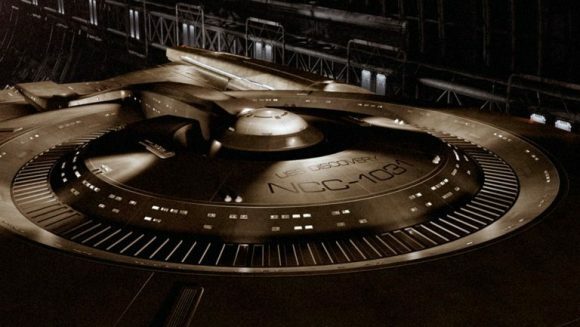 Within days of the USS Discovery’s unveiling at Comic.con (above), Sky’s sci-fi channel announced it will mark the parent show’s milestone with a pop-up channel devoted to Star Trek movies and classic episodes from the original and spin-off series. The Star Trek showcase will screen for six days from September 8 on Channel 900. Deep Space Nine’s Duet, Past Tense, Homefront, Paradise Lost and Nor The Battle To The Strong. The latest Star Trek series, Discovery, launches early next year on CBS’s digital platform, All Access, and will stream globally on Netflix, bypassing broadcasters like Prime that have output deals with its distributor, CBS Studios International. “There will be no Captain Kirk or Picard when the new Star Trek debuts,” says The Hollywood Reporter. “The official Trek site also confirmed that the TV series will not be connected to the feature franchise Star Trek: Beyond in any way. Showrunner Bryan Fuller (Hannibal) will oversee the 13-episode series that Trek creator Gene Roddenberry’s son, Rod Roddenberry, will co-executive produce. So glad that Netflix got the rights to screen the new series in NZ and not Sky. Have been enjoying watching all the old series of Star Trek on Netflix since they showed up earlier this month. Amen to that Aaron. Been enjoying the old series on NF as well.